The movie Fifty Shades of Grey is now showing here in my part of the world and I am quite sure that a lot of people have been anticipating its release. OPI came out with a nail polish collection for the movie comprising of 6 shades, 5 of which are greys and a red one to represent passion. Of course, there's a mini polishes box set as well that includes all the colors from the collection. No swatches in this post. Instead, I would like to share with you a couple of manicures I did with the OPI Fifty Shades of Grey collection. If you want a matching manicure when you see the movie or maybe because you are simply a fan of the book/movie, then perhaps you can find some inspiration with these simple ideas. I used OPI Dark Side of the Mood, Cement the Deal, and Embrace the Grey to create the gradient look. It's not 50 shades of grey, but it is pretty regardless. Perhaps you could use more shades of grey if you have longer nails. That would probably look more amazing. Aside from the creme, I also wanted to play with the only glitter polish of the collection. But on it's own, it is difficult to get complete nail coverage. So I used a technique I learned from a friend -- The Nailinator. I read a tip on her blog on how to easily increase opacity of glitter polish on the nails. Using her tip, I used load the glitter polish on a sponge and dabbed it on my nails. The best thing about this technique is that polish build up is at a minimum since the sponge absorbs the base of the glitter polish. Brilliant, right? The result is a bluish grey glittered manicure that I think looks stunning. Shine For Me has a clear base and works well with layering it on another color. I chose the darkest polish on the collection because I wanted the shine to pop and I it did not disappoint. The OPI Fifty Shades of Grey is a limited edition. So I suggest you grab your favorites soon or if you are a collector like myself, the mini set is a good addition to your collection. Nail art designs trend now,its a craze among most women and young girls. This designs are awesome. I really loved it. The style of your is very unique but easy to understand what you want to say in this discussion. Feel free to visit custom essay writing service for any king of essay writing. I am a great fan of the OPI nail paints. They always come up with sparkling colors having metallic effect. 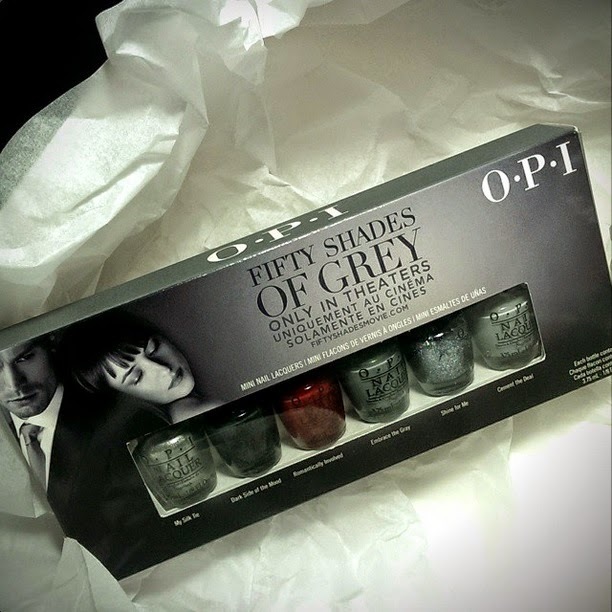 Now their this new edition of nail paint named as Fifty Shades of grey is something one must have!